Next month is, of course, Black History Month. Every year on my blog (www.joesmokethoughts.com) I work on different concepts, focuses, and ideas. This year my goal is "Brotherhood & Sisterhood Defined". I have sent out direct personal requests to a number of my social media friends, as well as lifelong friends. I would like to get everyone involved in this project if there is interest. You can do a couple of sentences, an essay, or even something recorded but I want voices, not of superstars but everyday black folks who want what Martin Luther King Jr. wanted in his lifetime a community of united folks dedicated to the uplift of our community. For 28 days I will post these messages of my blog for everyone to read. I am focused on developing the positive energy that accumulates when voices address the concept of universal brotherhood and sisterhood. When these voices provide strategies that promote the concept of brotherhood and sisterhood. 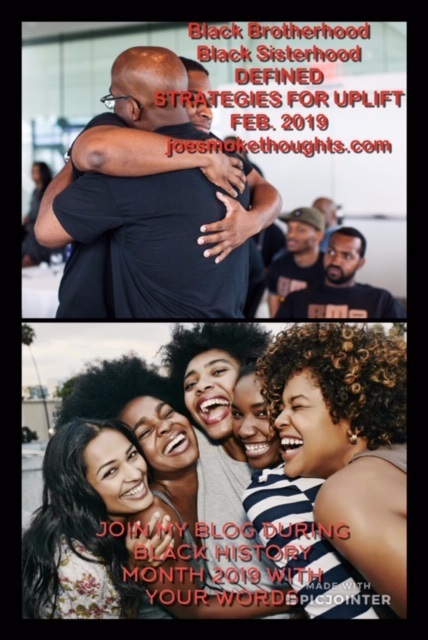 I have only one goal in mind to foster on my blog the spirit of Martin Luther King during the month of February 2019. Will those interested join me? All you need to do is send me what you feel is meaningful along with a photo that I can post to my blog and we can make this coming month really special for our communities. You can send them via my email, or message and I promise everyone will be posted.